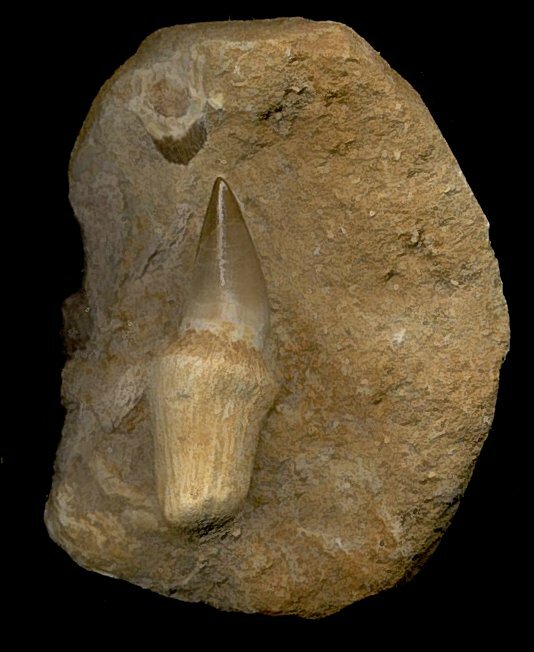 This is an excellent specimen of a Mosasaurus anceps tooth from the Cretaceous of Morocco. The complete tooth retains the full natural root, which is extremely uncommon. This tooth exhibits excellent detail - the enamel of the tooth is well preserved, and the tip of the tooth is still quite pointed and sharp. The fossil has wonderful color and contrast and is well displayed on the natural block of matrix. This is a very collectible, complete Mosasaur tooth with root from Morocco.